Pope Saint Marcellus I was pope from May 308 to 309. He succeeded Marcellinus, after a considerable interval, in May or June 308. Marcellus is credited with having reorganized and re-invigorated the Roman church after a period of harsh persecution under Emperor Diocletian. However, he faced a serious challenge due to internal strife within the church over the question of re-admitting to communion those whose faith had lapsed and had offered sacrifice to pagan gods. Marcellus took a hard line in demanding strict public penances for those who had lapsed. Outbreaks of serious and widespread violence soon disrupted his flock. In 309, Emperor Maxentius banished Marcellus from Rome on account of this tumult. He died the same year, being succeeded by Eusebius, who faced a similar fate. Marcellus' relics are under the altar of the Roman Church of San Marcello al Corso, which bears his name. His feast day is commemorated on January 16; it is no longer on the General Roman Calendar but is still celebrated on the Tridentine Calendar. For some time after the death of Pope Marcellinus, in 304, the Diocletian persecution continued with unabated severity. This was the last wave of persecution thousands of Christians dead before Constantine I made Christianity the state's favored religion left. Many other Christians had chosen to compromise their faith and show loyalty to the state by offering incense sacrifice to the Roman gods. One of these was the previous pope, Marcellinus himself, or so it was later reported. 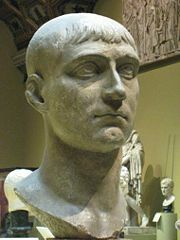 Maxentius, who exiled Pope Marcellus after internal strife within the church led to riots in Rome. Marcellus thus took charge of the church at Rome in a time of great confusion. The meeting places and some of the burial sites of the faithful had been confiscated by the state due to Diocletian's earlier edicts. Thus, the ordinary life and activity of the Roman church had been interrupted. Added to this were the dissensions within the church itself, caused by the large number of members who had fallen away during the long period of active persecution. Some members who had kept the faith held that these lapsed Christians should not be readmitted to communion, while others believed they should be shown compassion after a period of penance. Meanwhile some of the lapsed, themselves, loudly demanded that they should be readmitted to communion even without doing penance, especially in public. The work of the pope was, however, quickly interrupted by controversies over the question of the re-admittance of the lapsi (lapsed Christians) into the church. A poetic tribute composed by Pope Damasus I (d. 384) relates that Marcellus was looked upon as a wicked enemy by the lapsed, because he insisted that they should perform a prescribed public penance for their guilt. The exact form of the penance is not indicated, but it was apparently harsh enough that the requirement of its public performance provoked a severe reaction from many of the lapsed. As a result, serious conflicts arose, some of which ended in bloodshed. The peace of the Roman church was utterly broken, and riots broke out throughout the city, where the newly reorganized churches carried out Marcellus' strict policy. Church sources relate that at the head of the dissenters was a lapsed Christian who had denied the faith even before the outbreak of severe persecution. The disruption of civic peace resulting from these internal disputes provoked Emperor Maxentius to have the pope seized and sent into exile. This took place at the end of 308 or the beginning of 309, according to the Catalogus Liberianus. Marcellus apparently died shortly after leaving Rome. After his death, he was venerated as a saint and confessor. A fifth century version of Marcellus' death was included in the legendary story of the martyrdom of Saint Cyriacus. This tradition, which was adopted by the Liber Pontificalis, gives a different account of the end of Marcellus' life. According to this version, the pope was required by Maxentius, who was enraged at his effective reorganization of the church, to lay aside his episcopal dignity and make an offering to the gods. When Marcellus refused, he was condemned to work as a slave at a station on the public highway. At the end of nine months he was set free by the clergy. However, when he proceeded to consecrate the house of a matron named Lucina as a church ("titulus Marcelli") he was again condemned to work as a slave, this time attending to the horses brought into the above-mentioned station. It was while working in this menial occupation that he died for the faith. The tradition related in the verses of Damasus cannot be completely reconciled with the legendary account above, although it is possible that more than one factor—both the civil strife among Roman Christians and Maxentius' anger at Marcellus' re-invigoration of the Roman church—may have provided reasons for Marcellus' exile. Indeed, it does seem that Marcellus' effectiveness as an administrator may have been related to the rioting of the lapsi, who, as a result of the pope's reorganization of the churches, could no longer find priests who would treat them as Christians. 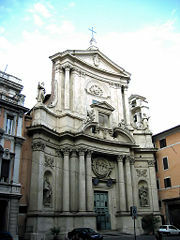 Rome's Church of San Marcello al Corso is traditionally believed to have been originally consecrated by Marcellus I. The feast of Pope Saint Marcellus is celebrated on January 16. This is the date of his death according to the Depositio episcoporum of the Chronography of 354 and other Roman authorities. However, it is not known whether this is the true date of his death or that of the burial of his remains, after these had been brought back from the unknown place to which he had been exiled. He was buried in the Catacomb of Saint Priscilla, where his grave is mentioned by the itineraries to the graves of the Roman martyrs. Marcellus' name is, to this day, borne by the church at Rome mentioned in the above legend. It is known today as the Church of San Marcello al Corso. In art, he is pictured with symbols related to the story of his work as a slave, sometimes with a donkey or horse nearby, or standing in a stable. The issue which plagued Marcellus' papacy—the question of readmitting the lapsed to communion—would continue to challenge the Christian church for a long time. Both the contemporary Novatianist movement and the later Donatist movements adopted the attitude that sins as serious as apostasy or turning over the church's sacred books to the state were intolerable sins. Marcellus' strict insistence that the lapsed must do public penance would place him in the position of a moderate in the "holy vs. Catholic" controversies. Marcellus was succeeded by Pope Eusebius, who followed Marcellus' policy on the question of the readmission of the lapsed. Eusebius faced a similar fate to his predecessor, being exiled after a short reign due to continued strife between internal church factions on this issue. Curtis, A. Kenneth, and Carsten Peter Thiede. From Christ to Constantine: The Trial and Testimony of the Early Church. Worcester, Pa: Christian History Institute, 1991. ISBN 9781563642005. Eno, Robert B. The Rise of the Papacy. Wilmington, Del: M. Glazier, 1990. ISBN 9780814658024. Farley, Lawrence R. A Daily Calendar of Saints. Minneapolis: Light & Life Pub, 1999. ISBN 9781880971246. Fortescue, Adrian. Early Papacy: To the Synod of Calcedon in 451. San Francisco: Ignatius, 2008. ISBN 9781586171766. Maxwell-Stuart, P.G. Chronicle of the Popes: The Reign-by-Reign Record of the Papacy from St. Peter to the Present. Thames and Hudson, 1997. ISBN 0500017980. All links retrieved September 17, 2014. History of "Pope Marcellus I"
This page was last modified on 17 September 2014, at 15:43.